Stephen Fry looks at the written word, starting with the earliest form of writing - cuneiform, and ending with the modern inventions of blogging and twittering. 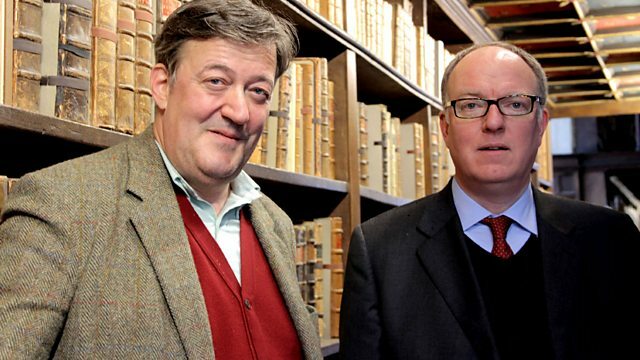 In this programme, Stephen Fry explores 'the written word'. Writing is a great invention - making it possible to communicate across space and time. Without writing we would have no history and very little technology. Stephen discovers the earliest writing - cuneiform - at the British Museum, and learns how our alphabet came from the Phoenicians. As part of his exploration of the diversity of scripts, Stephen visits 106-year-old Mr Zhou, the inventor of the Chinese phonetic writing system called Pinyin, who relates how literacy increased four-fold after its introduction under Mao. After the written word came the printed word, and Stephen looks at how this has shaped our relationship with writing, giving us libraries, dictionaries and encyclopaedias. From the Bodleian to Diderot's favourite café to the cutting-edge research at MIT, Stephen explores how the written word evolved into printing, then libraries, encyclopaedias and computer code. Blogging and twittering is just the tip of a brave new future which no one dares predict.